A property start-up has raised £150,000 from backers. Knock for Sale connects buyers with people whose homes may not be on the market, via ‘digitalised’ letter drops. Knock for Sale’s business model is based on two findings from research: first, that three times as many home owners are thinking about selling than the number of homes listed for sale online; and second, that 54% of home owners whose properties are not on the market would respond to an enquiry letter through their door. Knock for Sale cuts out estate agents and aims to boost the number of private sales. The website says that the service allows anyone to express an interest in a property “whether it’s on the market or not”, suggesting that it could be a vehicle for private buyers to ‘tout’ for homes being marketed by agents. Founded by Kerrie Powell and Allen two years ago, the business prints and posts cards from buyers to home owners. 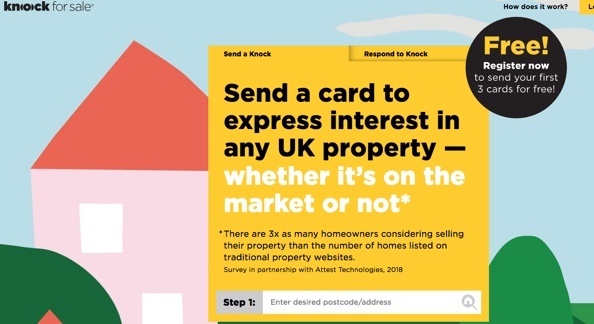 The site, which is funded by the £5 fee for sending a card, gives home owners the opportunity to connect with potential buyers via a secure messaging system. Powell said: “Data shows many home owners would seriously consider an offer if approached, even though they aren’t actively in the process of selling. “Increasing the number of direct approaches and private sales could oil the wheels of the property market. “Hand delivering flyers is recommended by plenty of property gurus but one of its pitfalls –along with territorial dogs and twitching curtains – is that buyers have to be there, and give out their contact information. “Our service offers a layer of security and convenience for buyers, as well as the opportunity to secure a home that’s not on the market. One of the new backers is Flatshare entrepreneur Rupert Hunt, who has invested £75,000. The remaining half comes from Felix Milns, founder of architectural practice Zulufish Residential, and actor and angel investor James Murray. Joke of a website. Just wont work. It costs £5 for each mailing. Why don’t they go the whole hog and engage an overseas call centre to contact house owners at 8,00 am with we have a buyer for your property but failing that do you want a new boiler ? 2 questions, doesnt GDPR prevent this company from addressing the homeowner by name, secondly why doesnt the interested party just hand deliver their own letter to the house in question? Even if it worked how on earth do these stupid “investors” ever expect a return on a service that only costs a fiver!! Moonpig it won’t be!! I want to say something about EPC’s and the general requirements to have them in place before marketing, but I haven’t read the small print of the company concerned so I am sure its in there somewhere…. oh and AML requirements? Yawn …. its April the 1st again, how many is that now within the last few months who haven’t a clue of the house buying process, one of the most stressful and often complex things people will do and haven’t a clue what is really involved and the misery they will cause for vendors/families. All based on “we can do it cheap” …. just another monkey offering peanuts to line their own pocket. Do they ever not have any friends or colleagues to just say “No, it’s a **** idea”?